This was actually two very separate outing though they happened to occur on the same day. The first was one of an occasional series of bike & hikes I do from home while the other was a full moon hike to a couple of small private property summits in the Morgan Hill area. The combination made for a pretty full day. The CC list was conceived by the Mother Lode Chapter of the Sierra Club several decades ago as a peak list for the California Coastal peaks from San Luis Obispo north to the Oregon border. It was never officially adopted and there was no serious work done to the list. It appears to have been conceived somewhat hastily, possibly based on AAA road maps in a time before the internet and more available resources. When I looked more closely into the list a few years ago I found all sorts of errors which I corrected, made some educated guesses on others and ended with two summits that I simply couldn't locate. One of these was named Weller Peak and listed in Alameda County. I knew of Weller Road that runs to the top of Monument Peak, but there was no official Weller Peak, and search as I might, I could not find a summit with an elevation close the 2,450ft given in the original list. Recently I was contacted by Jerry Kohn who appeared to have some knowledgable information about the list including the location of the two "missing" summits. It seems the listed elevation had transposed two numbers which made matching the elevation to a point on the map most difficult. The location turned out to be rather mundane, a minor point near Monument Peak that has little prominence and no good reason to be on the list. I have no doubt that a future revision will completely excise this peak, but in the interest of climbing the original list I knew I would have to pay it a visit. Luckily it isn't located too far from my house and I decided to do it as a Bike & Hike on a fine Thursday morning. Starting off around 8:15a, my route took me along much of the Guadalupe River Trail, past the San Jose Airport and into the northern industrial parts of the city. In this case, "industrial" isn't the brick and smokestack stuff of the rust belt but spiffy high tech campuses that define Silicon Valley. Though I did notice a brand-new natural gas-fired power generation plant near the sewage treatment facility north of SR237 - gotta keep up with electricity demands, even if we don't have enough water to feed our lawns here (at some point it will probably be paired with a desalinization plant). I passed through Milpitas along Calaveras Blvd, not all that safe on a bicycle in this busy corridor. 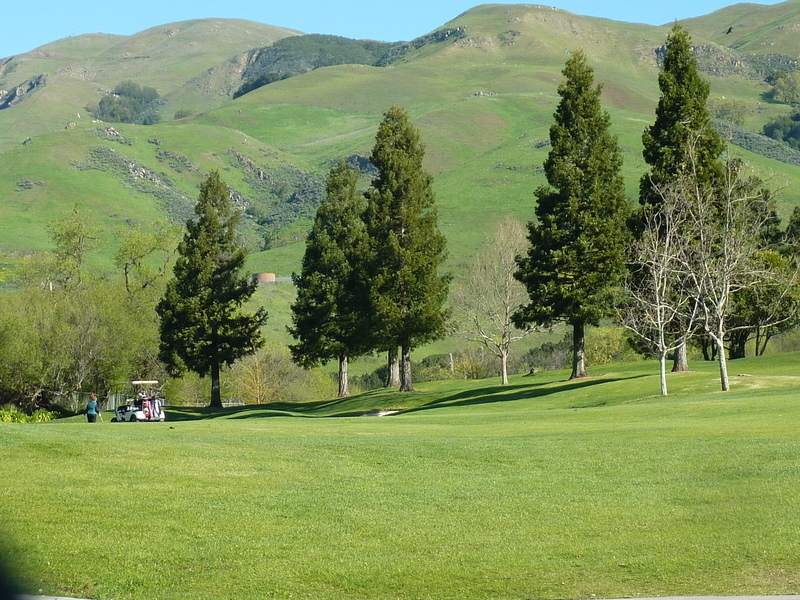 I eventually reached the edge of the hills and made the short but steep climb up to Ed Levin Park above Milpitas. There was plenty of activity on the adjacent golf course, but the park had few visitors on a quiet Thursday morning. The lone exception was a dozen or so folks engaged in hang gliding lessons on the gentle lower slopes at the edge of the park. Sandy Wool Lake was sadly lacking water, now less than half full. Boating has been suspended indefinitely not for lack of water but to prevent the spread of invassive mussels. I locked my bike at the north end of the park where the TH is located and started up on foot. It was a fine time of year to take a hike here with the hillsides about as green as they can possibly get. Cattle graze much of the route along the Agua Caliente and Monument Peak trails that I used to hike the 3mi+ distance to the summit area. Along the way one is treated to fine views of the verdant green slopes overlooking the South Bay. Wild mustard blooms in profusion, joined by colorful, though not so widespread displays of bright orange poppies. It was 11a when I reached the summit of Weller Peak, a grass-covered rocky bump just above one of the half dozen communication tower facilities that dot the area. The highest summit in the immediate area is Mt. Alison about half a mile to the north with almost 1,600ft of prominence. Monument Peak, and the slightly higher, unnamed Peak 2,620ft are found just across the road to the east from Weller Peak and I decided to pay them a visit as an easy bonus. I was back at the TH before 12:30p, having seen no other soul along the trail all morning. Another 12mi ride got me back home before 2p. I showered and took a nap in the warm upstairs for several hours before my wife came home from work to discover me. These two minor summits are part of the 175 peak collection that make up Santa Clara County. As my home county, I've made it a long-term project to summit as many of these as possible. Most of the peaks lie on private property which makes it more prudent to do them as night hikes when I am less likely to disturb the landowners who manage cattle on most various ranches that surround these summits. The two summits for this evening's hike are located in the foothills of the Santa Cruz Mountains west of Morgan Hill, overlooking Chesbro Reservoir. Both were relatively short hikes which was why I decided to combine the two for this outing under a full moon. We did the longer of the two, about 1.5mi one-way, first, starting from a ranch gate at the summit of Willow Springs Road. Immediately across from this gate is the Willow Heights Mansion. We had thought it was someone's residence, but it turns out to be associated with a local vineyard and is more often rented out for weddings and such events. There is parking for several cars near the gate, but otherwise no parking to be found along Willow Springs Rd. The hike was fairly tame, mostly along ranch roads with some easy cross-country up grass slopes. Toads could be heard croaking loudly in a nearby ravine as we started out, a few of them catching our attention as they hopped to get out of our way as we hiked along the road under the moonlight. Several property boundaries were encountered before reaching the top, the rickety fences posing the more technical challenges of the evening. The last road got us to within 200ft of the summit where I knew we might encounter more serious bushwhacking as judged from the satellite view. I had been prepared to leave these last 200ft untrammeled if it proved difficult, but Bruce was quite willing to dive into the dusty stuff and as luck would have it, it turned out to not be so bad. The brush was so dry that it easily crumbled underfoot and we soon found our way to the highpoint that, best as we could discern, was somewhere under the spreading branches of an oak tree, the place loaded with poison oak which had only made an appearance at the very summit. We found an even easier return to the road by sticking to the northwest side of the ridge (and fence that runs along it) where more open ground was found. We returned by substantially the same route, only deviating when we stopped paying attention and got off-route. A little more than an hour was spent on this outing.